On Tuesday, May 19, 2015 the Washington County Board of Commissioners unanimously voted to place two levies on the November 3, 2015 ballot. Both proposed levies would replace levies that expire in June 2016. 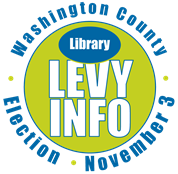 The first is a replacement levy for WCCLS which would maintain and increase countywide library services at a new rate of 22 cents per $1000 of Assessed Value. You can read the Library Levy Proposal here. The second is a renewal levy for the countywide public safety system. It is a continuation of the same levy rate of 42 cents per $1000 of Assessed Value. You can read the public safety levy proposal here.